Handozer Distributing is your best resource for a durable pull behind road grader for gravel driveway maintenance. Our years of experience working together with homeowners and ranch owners is our key to providing the best lawn tractor graders and driveway groomers on the market. Our 42’’ wide D3.5-MG pull behind road grader has a durable steel construction, and is made right here in USA. Gravel driveways over time need maintenance to repair washboard, washouts, potholes and compaction. Our Handozer driveway levelers are built specifically with ware resistant steel spikes to rip the gravel and our rear grading bar will grade, level and groom the most difficult of gravel driveways. 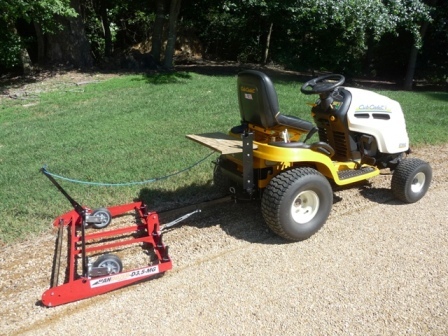 Handozer driveway groomers can handle gravel, soil, sand, and many other surfaces with ease. Perhaps best of all, you don’t need a large vehicle to pull our Handozer D3.5 MG driveway leveler, just a garden tractor or small ATV. Handozer pull behind road graders are designed to turn any lawn tractor into a lawn tractor grader. The 42” wide Handozer D3.5 MG also works excellent to groom baseball infields. Our leveler is perfect for grooming pro & minor league, high school and little league baseball infields. Do you have a horse area? The 42” wide Handozer D3.5 MG drag also works excellent to groom, grade round pens, indoor and outdoor horse arenas. If you need any help or have any questions to find the exact driveway grader, baseball infield grooming, or horse arena grooming Handozer product you’re looking for or need more information, feel free to contact our team of friendly representatives. We are absolutely dedicated to providing you with a well-built, American-made pull behind road grader/lawn tractor grader so that your property can look its very best.